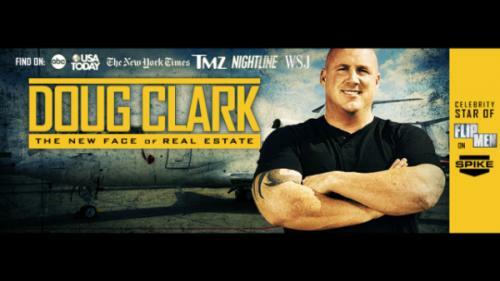 The New Face of Real Estate and Star of Spike TV’s Flip Men, Doug Clark profits in bubble, boom, or bust markets. Through his TV shows and education programs, Doug proves that anyone can make money with creative real estate investing. Salt Lake City, UT, USA / January 8th, 2014 / ACCESSWIRE / Doug Clark has earned the title the New Face of Real Estate by proving year after year that anyone can make money with creative real estate investing. Whether the real estate pundits predict a bubble, boom, or bust market in 2014, Doug teaches everyone who will listen that they can change their lives through creative real estate investing. Become a Successful Landlord – A proven way to make money in real estate is to become a landlord. It’s still one of the most popular investment strategies. Fix Up and Flip Houses – While many investors and hedge funds have adopted a buy-and-hold strategy, flipping is still an attractive and lucrative option under any market conditions. Wholesale Properties – Using insider knowledge and creative financing, investors are orchestrating wholesale property flips and building great success with little or no cash required. Doug is a TV star, international real estate investing educator, documentary filmmaker, celebrity event host, and radio talk show host. He has made such a broad and deep impact on real estate investing that he is recognized as a top real estate educator worldwide. In 2009, Doug created Foreclosure Boys, an award-winning documentary that exposed the then little-known world of foreclosure investing. Determined to help more people change their lives through real estate investing, Doug took his ideas to Hollywood and worked with Spike TV to create Flip Men. The primetime reality show follows Doug and his co-host Mike Baird as they try to turn foreclosed properties into profit. The success of Flip Men caught the attention of former co-chairman of NBC Entertainment, Ben Silverman, who went on take the show international by airing it in Canada, Mexico, the Dominican Republic, Columbia, Argentina, Peru, and Australia. Doug’s new show, Big Money, gives him the opportunity to put into practice the real estate investing principles he teaches internationally. Airing on ABC in early 2014, Big Money follows Doug as he helps ordinary people achieve financial freedom through creative real estate investing. Visit DougClarkEvents.com to learn more about Doug Clark, The New Face of Real Estate, and how to start making money with creative real estate investing. Visit http://www.dougclarkevents.com/ for more information.